On the second day of the trial of a Sligo man for deception in relation to the sale of a pony, the man who had bought the animal said he was flabbergasted when it arrived in Majorca where he and his family lived. Sean Ewing told Sligo Circuit Court that he had an agreement with Michael Kearins to buy two ponies - a grey and a skewbald - for his two daughters, but when the ponies arrived at the stables, the skewbald was a completely different animal to the one he and his family had viewed in Ireland. Before the video was shown at Sligo Circuit Court, Mr Kearins’ barrister, Patrick O'Sullivan, told the jury that the defence completely accepted that the pony viewed by the Ewings in August 2012 was not the same pony sent out to Majorca; it was a different pony. He said they were quite naive in their dealings with Mr Kearins; they had a lot of trust in him and he was known as a proficient rider so they believed they were dealing with the right person. Mr Ewing said that when the €10,000 deposit was paid over to Mr Kearins, the dynamic changed and communication became less frequent. After the ponies arrived in Majorca, he said he tried to call Mr Kearins but he said he did not answer the phone and did not respond to five very detailed emails. The court was told that Mr Ewing sent the two ponies back to Mr Kearins in Knockbeg, Collooney in Sligo in January 2013 with a detailed bill including livery and veterinary costs, but he got no response. Under cross-examination by defence barrister Peter O’Sullivan, Mr Ewing denied that he was arrested on suspicion of fraud in California. Mr Ewing said that he was chairman of a large global company worth $1 billion and the issue was a books and records violation against an employee. Mr Ewing said he was never indicted and all matters pursuant to him were dismissed with prejudice. He said he made an offer of $8 million which was accepted by investigators in 2016. Earlier, Mr Ewing rejected a suggestion by Mr O'Sullivan that Mr Kearins had contacted his wife, Terri, to say that Buddy was no longer for sale because of a delay on Mr Ewing’s part and that she requested he source another pony with the criteria it should be very quiet and suitable for novices. Mr O'Sullivan said Mr Kearins will give evidence that he got a replacement pony in Kilkenny where he saw it being ridden by a young child and in his professional opinion it had the right temperament as a replacement for Buddy. Mr Ewing said it was preposterous to suggest that his wife would agree to some random pony and never say it to him. Mrs Ewing told the court that when the two ponies arrived in the stables in Majorca her daughter Susie, who was to get Buddy, fell apart and visibly crumpled when she saw the pony that was there. She said the pony which had been delivered - Spot - was a very sick pony, much smaller than Buddy, they were similar in colour, she said, but that is where the similarities ended. 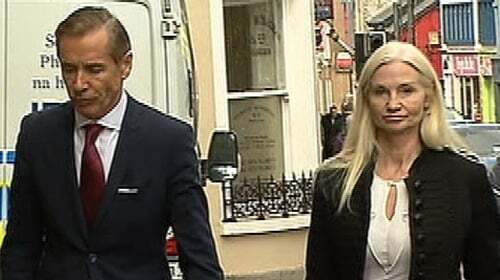 Mrs Ewing told the court that Spot had to be treated for an infection with antibiotics for a week. She said a vet estimated his age at 14 years old but his passport indicated he was nine and she was told he was useless as a showjumper and therefore worthless. Mrs Ewing said Spot was a danger to handle and was a kicker, claiming he kicked her. Mrs Ewing described Mr Kearins claim he substituted one pony for another as bizarre. She denied she ever had any conversation with Mr Kearins in which she asked him to source another pony in place of Buddy. Asked by Mr O'Sullivan why they sent both ponies back to Sligo in January 2013 and not just Spot, Ms Ewing said that Teddy, the grey pony, had a high degree of lameness when she arrived and it was not fair to showjump her, saying it would be cruel. They had bought a showjumper, Mrs Ewing said, but they could not show jump her. They were paying livery and veterinary fees for both ponies and by the end, Mrs Ewing said, they had lost about €25,000 and the only way to stop losing money was to send back both ponies to Mr Kearins because both ponies were worthless.